The Australian Securities regulator (ASIC) has come out with a long review of buy-now-pay later arrangements in which it has decided to do nothing monitor the companies going forward. This is perceived by some as very bullish for Afterpay. The stock is up fairly hard as I write this. Afterpay (ASX:APT) is the big player in this industry and a cult stock and cult product amongst Australian millennials. There are several other players and ASIC's study covered six of them. ASIC does not have a reputation as an aggressive regulator so that they are monitoring the company going forward is the expected result. But the ASIC report (available here) does give some insight into Afterpay. Vicki was in her early 20s and a mother to three preschool-aged children. She was unemployed but received Centrelink payments. Vicki had multiple payday loan debts totalling $4,000 and a $9,000 car loan. Vicki also had a $1,000 debt to Certegy Ezi-Pay that had been referred to a debt collector and several telecommunications and utility debts. Note that Afterpay is the last lender here and lent after a previous debt had been referred to a debt collector. John received a carer’s pension. He was cold-called by a merchant who sold him a solar power system financed through Certegy Ezi-Pay. John said he did not have a job at the time and the salesperson said that he would write down John’s last job. 18 months later, he owed over $6,100. John also owed over $7,000 on a loan and $3,000 in other debt. John said he started using Afterpay in early 2018 and now owes them $960. He said he doesn’t recall being asked about his expenses when he signed up for this arrangement. Note again Afterpay is the last lender. Ben was unemployed, received a disability support pension, and lived with his father who assisted him as a carer. Ben said he had a shopping addiction. Ben reported feeling overwhelmed with debt. He had a $5,000 credit card debt, and he was able to accrue a $1,500 debt with Afterpay, and a $1,000 debt with zipMoney. In this case Afterpay lent after the consumer was clearly in trouble. But they may not have been the last lender. Afterpay is considered the gold standard in this sector. It has the most highly valued stock. I have asked several bulls and they all tell me how much better Afterpay is than the competition. But ASIC have the numbers. 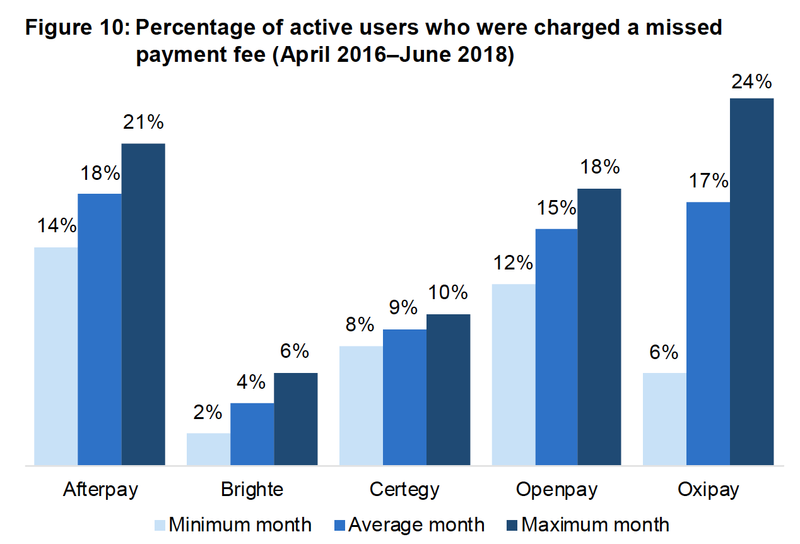 Here is a graph of the percentage of Afterpay customers who incur a late fee versus the competition. It sure looks like Afterpay has the worst credit quality. All I can say is that ASIC have helped out researching a controversial stock.